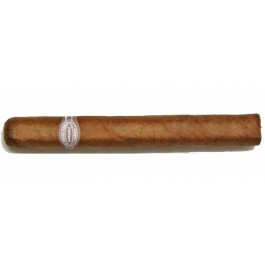 The Rafael Gonzalez Petit Corona is a Habanos delight, a light bodied Mareva, 5.1” (129mm) long, of 42 ring gauge, and comes in a 25 cigars box. This is a very mild cigar, however very rich in flavors with an excellent construction. Produced in limited amounts, this cigar has all the more consistency in quality. It is a perfect small cigar for a morning break or a lazy afternoon. If you have a chance to get your hands on it, do not miss it. Mild cigar with an amazing construction. • Its richness and balance of flavors reveal its excellent quality . • A cigar that can be enjoyed young or aged. A relatively unknown cigar that shouldn’t be missed by any Habano aficionado. 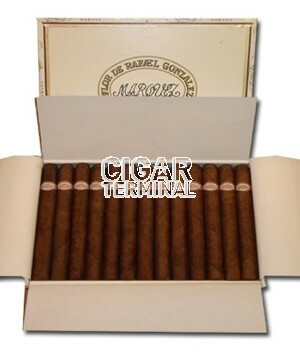 The Rafael Gonzalez Petit Corona looks just perfect, with a delicate box-press touch. It has a relatively oily medium to dark brown colored wrapper. Few veins can be spotted on the wrapper, but they are not too obvious. The squeeze test reveals a quite firm cigar, just enough. At cold, it smells of breakfast cereal and of sweet grapes. The cold draw gives lots of woody and cedar aromas, coupled with some of coffee with milk and again some raisins. The Rafael Gonzalez Petit Coronas seems to be a reminder of the Montecristo No.4 or the Juan Lopez Corona. There are also some subtle hints of chocolate. After cutting the cap, the draw is slightly firm, just enough resistance. All through the cigar, the draw stays as close to perfect as can be. Even if not always burning evenly, it self-corrects with few puffs on the fire. The ash can therefore build up solidly to a very dark gray. The smoke itself has a very pleasant scent. When torching the foot of the cigar amazing aromas of chocolate, burnt cedar and of some sweetness float to my nose. Unsurprisingly, the first puffs reveal a dominance of cedar, with some spicy notes on the back of the throat, but nothing too harsh. The smoke is very mild, not quite a medium strength. Woodiness aside, there is also lots of richness in flavors in the first third of the Rafael Gonzalez Petit Corona, that of freshly baked bread, a nice sweet raisin taste, reminder of a San Cristobal El Principe. There are also some hints of leather that linger on the palate. It is a very smooth and elegant smoke, just few amount of dryness and bitterness of wood and strong cocoa round up the whole flavors. When arriving towards the second third, the Rafael Gonzalez Petit Corona reveals its amazing construction. All the flavors are working beautifully together, each one balancing the other one. One could say this is like having a Montecristo No.4 and a Sancho Panza Non Plus rolled together into one cigar. The sweetness of the chocolate and raisins is balanced with the sourness of smoked wood and of unsweetened cream. If we have to pick a flavor that stands out during this third, we can say that a deep tobacco flavor is predominant, coupled with a nice pepper pinch on the back of the palate. There are also some flowery hints that bring a sweet note of honey. What this cigar shows in this middle third is just a glimpse of what it can deliver once it has aged several years. There is so much control in term of balance of flavors that I can hardly wait to try a more aged Rafael Gonzalez Petit Corona. In the last third of the cigar, the flavors profile is similar to the one we enjoyed in the middle third. Charred wood is still very present, as well as toasted bread. Approaching the very end of the cigar, the strength and the spiciness went up a notch, the cigar becoming medium. Nothing too much though, just emphasizing what this cigar has best to offer. In summary, the Rafael Gonzalez Petit Corona is a way-too overlooked cigar. For this relative affordable price, you can get a perfectly constructed Habano, which is graceful, rich and endowed with its own character. It is also a cigar that as a great potential for aging.